Tonight Ryan felt his baby girl kick for the first time! It doesn't seem like I've been pregnant that long. I can't believe I'm almost 5 months already. I went to Gymboree yesterday during lunch and bought the first of many pink outfits. I'm trying not to buy too many summer clothes because I always guessed the wrong sizes with Zack, but it is so hard to resist the cuteness. I'm really not looking forward to moving Zack to the guest bedroom and painting over the nursery walls. I think a lot of pink shopping to help fill the closet will make the transition easier on me though. 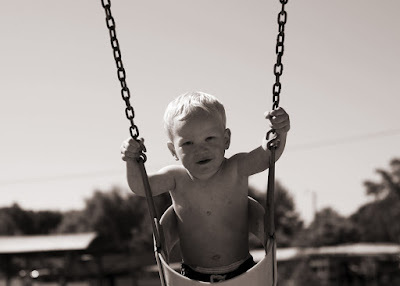 I thought movement pictures would be appropriate for this entry, so here is a picture, color and black and white, of Zack swinging over the weekend. How exciting that your husband felt your baby girl move for the first time. I would be tempted to buy all the pink stuff I came across too. Girl stuff is just SO cute! 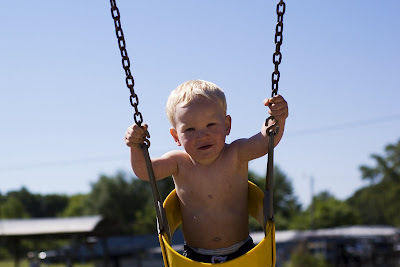 Love the swinging pics of Zack. ahhh...don't you love that! I've just started feeling little flutters, but nothing Trevor or Teagun can come close to feeling yet - I can't wait! Feeling Ethan move in my stomach for the first time was the coolest thing in the world! I bet Zack thinks so too! BTW, I love the nursery! I've slowly been buying things for when we switch Ethan's nursery over to the "big boy" room. I'm soooo sick of Winnie the Pooh. And we will be changing it to a transportation room -- you know, planes, cars, trucks, trains, that sort of thing. so i'm excited. I don't even want to think of tackling Cameron's room. But it is so "Baby" with the yellow and green (I chose neutrals) thinking if I had a girl a few years later, she could use it. However, Ava came sooner than we anticipated! Anyway, I remember feeling the kids move in my belly - it was weird and beautiful at the same time! Bring on the pink!!!!! I am so excited for you!! !